Kasota Solutions provides its services around the United States through relationships with its strategic partners. We leverage our expertise with regional partners to provide the best services to our clients. Kasota’s focus is on commercial property with a specialization in health care real estate. Our partners have participated in all sizes and values of projects, from multi-million dollar ground up development and construction projects and to providing debt or equity financing to secure a deal. 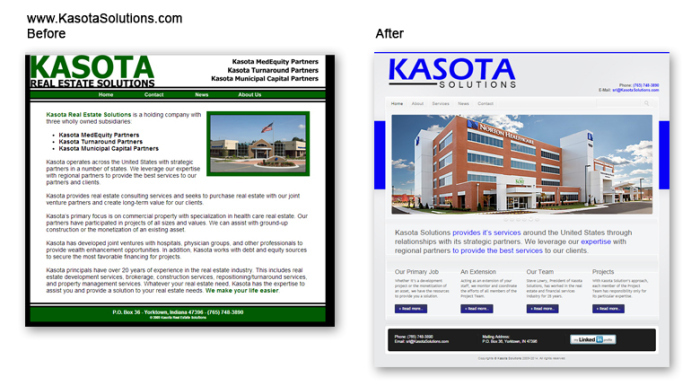 Kasota Solutions is a growing boutique firm located in the Midwest and operating across the country. With this kind of exposure, this growing company need a Brand Refresh. McCormick-Dishman created a refreshed logo, changed the color scheme and, built on a WordPress platform, gave Kasota Solutions a simple, clean, professional website to showcase the amazing work they do.